"Lovely timberhome. Picturesque views. Right on the sea - fish, swim and sail! Sleeps four." 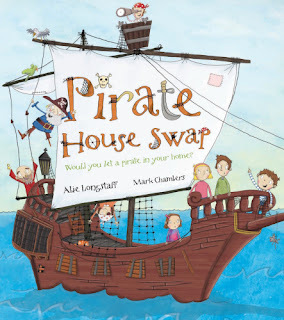 The Clarks set off and find that their new home is more in the sea than on the sea - it's a pirate ship, complete with ship's parrot and crow's nest. Rather than being daunted, the family actually embrace the pirate's life. Soon enough they are navigating by the stars and having the time of their life. Back at the Clark's home, the pirates too are getting used to landlubbing ways. "For Sale: magic beans. Not for eating. May cause giants. One cow o.n.o." At its heart, this is a story about resilience and bravery in the face of new experience. It is also a light-hearted look at how people with different cultures rub along together. I particularly liked the Clarks' return home, where they discover that the pirates have been doing some d.i.y. of their own. Lots of the damage can be repaired, but some changes are permanent. Next door's cat, for example, won't be giving up his earring any time soon. Pirate House Swap is a great book to share with the top end of picture book readers who will enjoy decoding the pictures alongside the words. It's a great, gender-neutral companion to Abie Longstaff's The Fairytale Hairdresser which had a same delightful humour, but was a bit pink to be shared with boys. Sounds delightful. Will look out for it! looks interesting going to try it out.